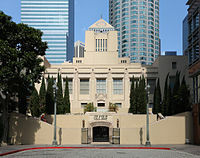 English: Los Angeles Central Library — on Fifth Street, in the Financial District of Downtown Los Angeles, California. The 1926 building was designed by Bertram Goodhue, in an eclectic Mediterranean Revival, Beaux-Arts, and Egyptian Revival style. An eight-story atrium wing addition, designed by Hardy Holzman Pfeiffer Associates, was completed in 1993. A Los Angeles Historic-Cultural Monument, and on the National Register of Historic Places in Los Angeles. Media in category "Los Angeles Central Library"